Officials say test results from ISIS attack in Syria confirm mustard agent was used. Similar attack in Iraq still under investigation. 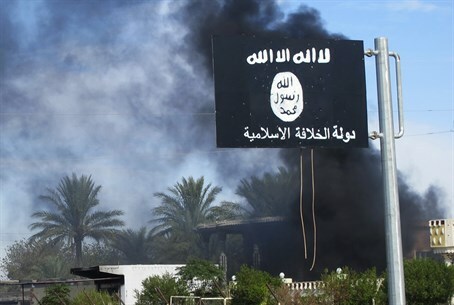 The United States government has test results from an Islamic State (ISIS) attack in Hasakah, Syria, from two weeks ago that confirm the terror group used a mustard agent as a weapon, intelligence and military officials told CNN over the weekend. The U.S. is continuing to investigate an attack this week in northern Iraq that also has indications of a similar chemical agent being used, the network reported. Officials stress the amount of chemical agent is thought to be small and the concentration low. But it is yet another sign that ISIS is in possession of mustard agent and is using it in battle. The U.S. is still investigating the amount and sophistication of how the agent was delivered. One official told CNN the mustard agent used in Syria is more likely precursor chemicals, rather than a complex munition, a sign this did not come from a cache of Syrian President Bashar Al-Assad but was probably mixed by ISIS on its own, using agents or precursor chemicals it obtained. Precursors are chemicals involved in production stages for toxic chemicals, according to the Organization for the Prohibition of Chemical Weapons (OPCW). The officials would not disclose what type of sample was collected. Samples are also coming in from an attack earlier this week near the town of Makhmour in northern Iraq, a U.S. official said. ISIS jihadists carried out that attack using mortar shells carrying a chemical agent Kurdish fighters had not encountered before, the Peshmerga field commander for Makhmour, Brig. Gen. Sirwan Barzani, told CNN. Barzani said the coalition official who originally took samples from his men of the chemical substance they were exposed to has called him back to say the samples have been tested and show mustard, but U.S. officials said the samples from Makhmour are still on the way and nothing has been concluded. So far, only the incident in Hasakah is confirmed to be mustard agent, according to CNN. U.S. Central Command spokesman Col. Pat Ryder said "we don't know what, if anything, may have been used" in northern Iraq. Information regarding the use of mustard gas by ISIS is relatively new. U.S. intelligence agencies have said in the past they believed the group has used chlorine gas in attacks in Iraq, though chlorine is not a banned chemical agent.